The tangible output from the project is a large range of resources which support learners to access the curriculum. Resources have been made to support the curriculum for Foundation Stage, Key Stage 1, Key Stage 2 with some links to Key Stage 3, across all subjects. Material ties in closely to schemes of work and topics schools teach as well as the Primary Frameworks for Numeracy and Literacy. 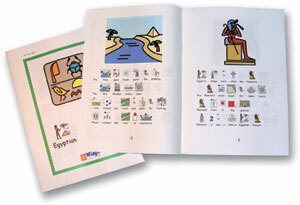 Packs have either information or story books with different levels of symbol support, activities, key vocabulary, and worksheets. Maths Pack, the complete set of maths symbols for the vocabulary specified in the Primary Framework for Numeracy. A range of materials and information linked to creating a Communication Friendly Environment in schools are also available. Other resources and information support behaviour management strategies, and promote emotional and social wellbeing. The first phase of training was for DISCS teachers and TAs in Warwickshire's Designated Speech and Language Provisions (DSLP), of which there are seven across the County. This training was held at central localities, jointly planned and delivered by a Specialist Speech and Language Teacher and a Speech and Language Therapist from the Primary Care Trust. Next came dissemination training under the Communication Friendly Environment programme, to which all schools were invited.School staff who attended the centralised CFE training were allocated a minimum of half a days free coaching to help them nurture and move forward with new ideas in their own settings. Later on in the project a greater emphaisis was placed on delivering the training in school.This was felt to be a more effective means of implementing change. Both teachers and teaching assistants from the Speech and Language Team were trained to be able to deliver the training. Workshop sessions on Communicate: In Print, and raising awareness about the resources have been held county wide from 2006 until the present (2011).